Silverline Subaru BMR Racing endured a challenging weekend at Donington Park for Rounds 4, 5 and 6 of the 2016 Dunlop MSA British Touring Car Championship. 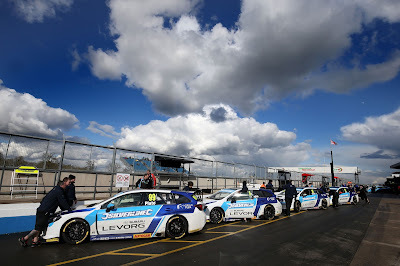 With the very small time frame between Brands Hatch and Donington Park, the team was once again realistic about using the opportunity to focus on developing the cars during the weekend to make as much progress as possible with the new Subaru Levorg GT sports tourers. With the cars having had very little time out on track, each session is being used to learn about the cars to make improvements in a bid to find the right set up to ensure that we move forward to produce the best package possible. Saturday’s qualifying session looked to be a tricky one with a constant change in weather and subsequent track conditions. Colin Turkington set the quickest time out of the Subaru Levorg drivers setting the 11th fastest overall lap time of 1:14.160 followed by Warren Scott in 16th, James Cole 17th and Jason Plato 18th. Race 1 saw Warren involved in an incident with Ollie Jackson at Redgate, which fired them both into the gravel. The race came to a dramatic end for the team after it was eventually red-flagged following James’ Subaru Levorg catching fire as one of the fuel ancillary systems failed. James escaped without injury with the assistance of the marshals and fire crew, but unfortunately the car sustained a great deal of damage putting an end to James’ weekend. Colin was once again the quickest driver of the quartet finishing in 10th position and scoring points for the team with Jason just out of the point scoring zone in 17th. Warren was able to return to track after his earlier excursion and ended the race in 25th place. Mat Jackson was handed the win ahead of Josh Cook and Tom Ingram. Race 2 commenced with the drivers lining up in the positions that they finished the previous race and, with Colin being 10th on the grid, he was in for a chance of another top 10 position. Despite making a great start, unfortunately Colin sustained contact on his right rear causing a puncture and sending him into the gravel. Warren finished 19th ahead of Jason in 20th. The race was won by Rob Collard with Aron Smith and Gordon Shedden completing the podium. For Race 3 Warren and Jason both started on row 10 of the grid in 19th and 20th positions with Colin starting all the way down in 27th due to his earlier non-finish. Despite his starting position, Colin progressed through the field from the back of the grid making up an impressive nine places and finishing in 18th place, just behind Jason in 16th. Unfortunately Warren retired from the race upon instruction from his pit crew following the same component failure that was seen on James’ car in race 1. Matt Neal took the honours from Gordon Shedden and Sam Tordoff. 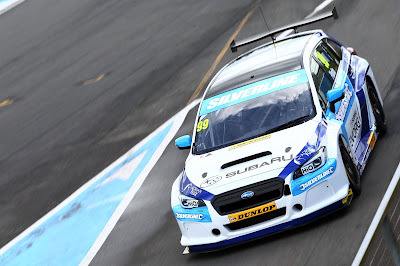 Jason Plato said: “Donington proved to be very productive for Silverline Subaru BMR Racing. We continue to gain valuable insight into the development of the team’s Subaru Levorgs. We achieved a great deal this weekend, which will accelerate our performance on track in the coming weeks. We know the areas we need to improve upon and are working flat out to find solutions. “I'm still confident that our target of challenging for podiums will arrive before mid-season. Colin Turkington said: “We walk away from Donington with a few more grey hairs, but with an abundance of information and a deeper understanding of the Subaru Levorg. Changeable conditions on Saturday provided a new set of challenges, but we coped remarkably well and my confidence with the car is growing all the time. “Having only completed a shakedown run with the cars since the last event, I was happy to once again qualify just outside the top 10. I enjoyed a typical BTCC battle in Race 1 and it was pleasing to bring the car home in 10th position and score a few more championship points. An early puncture ruined any chances of advancing in Race 2 but again in Race 3 I was able to show the strengths of the car and progress through the field. James Cole said: “I came away from Donington with only positive thoughts about the future with Team BMR and the Subaru Levorg. Despite our little problem on Sunday we are starting to see the cars’ potential - this process just takes time. “Saturday was a very productive day for the team and me, I enjoyed the mixed conditions of qualifying, and making the decision very early to go from wet tyres to dry tyres on a damp track really showed the cars handling strengths. It filled me with a lot of hope for the coming rounds. Warren Scott said: “We are pleased with the information that we are getting from the cars despite it being a tricky weekend and only two weeks after the launch of the Subaru Levorgs, and I am confident that we are showing signs of real improvement. Rounds 7, 8 and 9 of the 2016 Dunlop MSA British Touring Car Championship will take place at Thruxton, Hampshire, on 7th and 8th May.